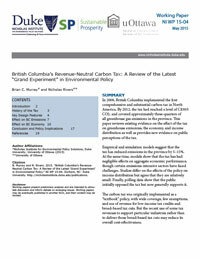 In 2008, British Columbia implemented the first comprehensive and substantial carbon tax in North America. By 2012, the tax had reached a level of C$30/t CO2, and covered approximately three-quarters of all greenhouse gas emissions in the province. This paper reviews existing evidence on the effect of the tax on greenhouse emissions, the economy, and income distribution as well as provides new evidence on public perceptions of the tax. Empirical and simulation models suggest that the tax has reduced emissions in the province by 5–15%. At the same time, models show that the tax has had negligible effects on aggregate economic performance, though certain emissions-intensive sectors have faced challenges. Studies differ on the effects of the policy on income distribution but agree that they are relatively small. Finally, polling data show that the public initially opposed the tax but now generally supports it. The carbon tax was originally implemented as a “textbook” policy, with wide coverage, few exemptions, and use of revenue for low-income tax credits and broad-based tax cuts. But the recent use of some tax revenues to support particular industries rather than to deliver those broad-based tax cuts may reduce its overall cost-effectiveness. This paper was subsequently published in the journal Energy Policy.